The annual insane season at work is over for now, and it’s time to get back to my poor neglected cyber child. So, what better way to start the new month than to look back at everything we missed during the past week? 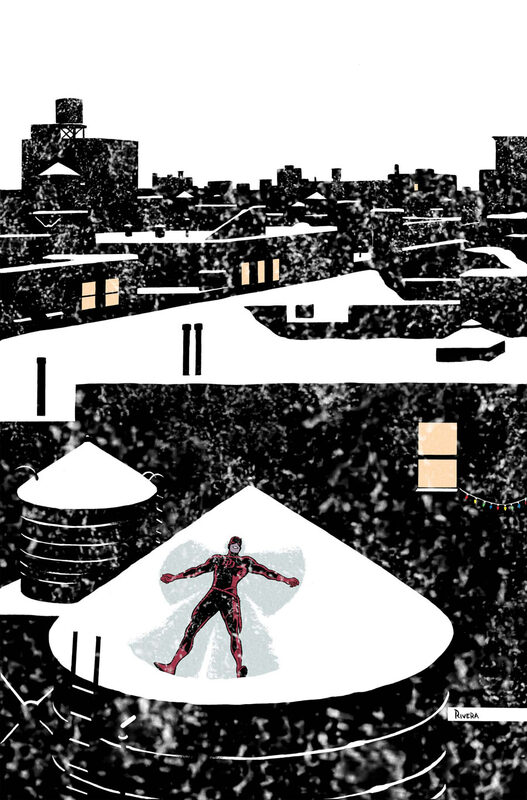 Marvel has released the December solicitations including the one for Daredevil #7. 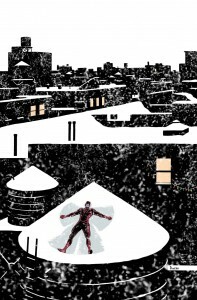 Without giving anything away for those of you who stay away from even the most innocent of spoilers, I still want to direct your attention to Paolo Rivera’s cover (there is also a pretty cool variant cover by Alex Maleev) showing Daredevil making snow angels, as shown here on the right. I’m sure this will seem a bit too whimsical for many of you, but I think it’s just perfect for a December issue. In other news, Marvel.com did an interview with Mark Waid a few days ago in which he talks about this month’s issue – due out on October 26 – going into quite a bit of detail about some events on the horizon. Stay away if you want to avoid spoilers or just give it a glance to check out the featured preview art from Daredevil #5. If you can’t get enough on the interview front, iFanboy has an interview with Wellinton Alves, the penciler for the Daredevil: Season One original graphic novel. This is my 498th post which means a big anniversary is coming up next week. While nothing earth-shattering will be happening around here, there will be some news to reveal when the big 500 rolls around! For those of you who didn’t know already, I’ll be going to New York Comic Con this year! It’s my first time at NYCC which starts on October 13 and ends on the 17th, and I’ll be there for the whole event. Of course, I will try to share the experience with you as much as I can. All I can say for now is that for at least one of the days I’m there, I’ll be wearing the T-shirt you see below. The braille reads “Matt Murdock likes my shirt better than yours” and the design is handmade by longtime Daredevil fan Alice who sells custom-made braille shirts through her site www.brailletshirts.com. Cool, huh? Okay, that’s it for now! Have a great weekend! "Hell’s Kitchen" update and celebrating 100 posts! I bet you’re wondering why this feat is worthy of its own post. Well, to be honest, this is not my first time as a blogger. Btw, I think the link may be broken. I had to retype the web address to reach the site. But it was worth it! 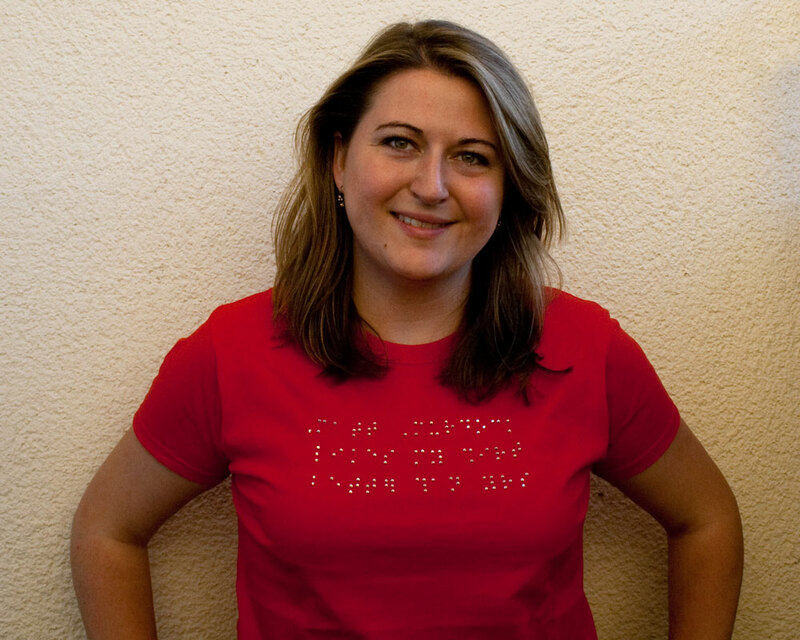 Better watch out for smart-asses in NYC that might want to try to “read” the braille on your t-shirt.